Question: In the last convention in Israel I felt an unprecedented sense of connection. But afterward, for a week I felt such a descent, which, too, I had never felt before. Now I am afraid of conventions. What can I do? Answer: It is very good. It is excellent. We should really be afraid. We also see that before the exodus of the people of Israel from Egypt. Just imagine that you are being thrown out of the place you are used to, and that you escape in the middle of the night, not knowing where to. Pharaoh’s cavalry is chasing you. You are confused, you jump into the Red Sea, and suddenly a miracle takes place. Actually it isn’t so delightful. Then the people praise the Creator: “The horse and rider drowned at sea.” But we should understand that a person goes through very extreme states that resemble birth; he feels great pressure like an embryo during labor pains. Then the point of Moses gladly comes out of every heart, the point that pulls us toward the Creator. We connect these points and discover to some extent the connection with the upper force. It is done gradually: At first only the point of Moses discovers Him, while the other points—the sages, the elderly, the priests, the Levites, Israel, the women, the slaves and the children are standing at the foot of the mountain. They say, “We shall do and we shall hear.” In other words, all our desires that are ready to surrender receive the force. It is happening today, and the next day we immediately build the golden calf. It is important that we understand: It is all within our reach. We escape the ego, and we really need to feel this escape. You come to the convention, fully ready, fearing that you might not fulfill the mission and reach the desired goal. You are afraid of being restricted and obliged, just like the escape from Egypt. On the other hand, you feel obliged to all the friends. You look at them and you desperately look for our collective point of connection. Eventually, we should bring all our powers to one moment. But for that moment we should be taut during the whole convention, like a taut string. We should be connected in time, movement, and place, in the connection among us. It is said: “Israel the Torah and the Creator are one.” This is like the situation of the great priest in the Holy of Holies on Yom Kippur….We should reach that one single unique moment and then it will happen. Then the path will continue, but it will be with the connection to the Reforming Light. These are the conditions: You are actually running away; it isn’t in your power to go back to your previous life; you must achieve the desired goal; and at the same time you must pull together all your powers for that single moment. This aims you very sharply at the target. Let’s see how all this will happen. This means that we with our egoistic desire will see the beastly life as “wonderful.” We will feel that we are in this “beastly burial,” and some won’t even feel that. Then instead of internal mental, goal-oriented, human disturbances, we should expect beastly problems from which the whole world suffers. Therefore, we must prepare for the convention very seriously. If we’ve taken it upon ourselves, we mustn’t withdraw. It is a very narrow bridge and the main thing is not to be afraid. Question: What do the “black letters on the white background” signify in spiritual work? Are the letters the deficiencies (desires) that are revealed on the background of the white light? Answer: It is impossible to discover one without the other. We are the creatures, and the Creator is the force of bestowal. We don’t understand His feelings and attainments since we are built completely differently. The only thing that we are able to attain is the preference of light within the darkness. So we comprehend reality only on the contrast between light and darkness, between bestowal and reception. A letter is a symbol. It is possible to look at it as black lines on a white background, and it is possible to see the white light that has something missing. In both ways it will be the same letter, but from different points of view: from the side of the Light or from the side of the Kli, the desire. It all depends on how you understand deficiency. It could be that your deficiency is perceived within the Kli and you are waiting for a more pleasant feeling in order to receive fulfillment for yourself? Or it could be that your deficiency is felt in relation to the Light: When will I be able to bestow and be included within the Light? This means that I am waiting for the Kli to be included within the Light and not that the Light will enter the Kli. The work is always possible from two directions. Everything depends on how you consider adhesion to the Creator: Is the Creator included in the creature or is the creature included in the Creator? The Creator joins the creature in concealment since after all, He is always within him, directs him, and loves him. But He gives us an opening, a small deficiency, so that we will move towards Him and yearn to adhere to Him. The measure of adhesion is the “letter,” the black lines on a white background that show the extent to which I am adhered to the Creator. On one hand, the letter, so to speak, is missing the white light. But on the other hand, I cover the white light myself. I am now in the white light, but I am detached from it; however, I add to it my letter. And because it is black, I succeed in writing something from myself on the white. Thus, even if the letter is black, in any case, it expresses the extent of my adhesion to white. The letters clarify how much the creature is similar to the Creator. And despite that the white light, as it were, appears to have some kind of deficiency—that is my addition to it. Answer: I will give you the following definition. – Is broken, destroyed, and facing a dead end! And recently, even the frameworks that existed have broken. He was a workaholic, a slave to his master, brainwashed by pop culture imposed upon him by television and corrupt mass media. And lately he discovers that he has lost any direction since he does not have a job; now he really sees that everything is over and he doesn’t know what to do next. He has lost everything! And then he is ready to listen a bit. I do not go this person to list all the abovementioned bitter definitions. I tell him: “You are a person! You can now change your life. Let us see what we have today.” And I gradually tell him about all the flaws and the way we can correct them by building a society, an environment, that will change us, and we will want a new life. Let’s see how we can achieve security, health, a happy family life, good children and a proper upbringing and education for them. Let’s see how we can find work and also give people fulfillment in life, an atmosphere of hope and confidence. How can this be attained? We need to change ourselves for this. Society is everyone of us and the relationships between us. Let us start changing it: How is that possible? A person’s only free choice, his only way to change himself and human society, is through the influence of the environment. If the environment is the only thing that can influence a person, then we need to build an environment to influence us. You are in the process of educating yourself; no one will come to educate you. Even though I am the teacher and I am explaining what needs to be done, it is together that we discover the problem, discuss it, and wish to find the form of bestowal that will change us and form the new environment. I do not treat you like a small child; I rely on your realization of evil and your analytical ability. I believe in your ability to attain a level of development when you will understand the entire creation, the entire world, and together we will also change all of humanity, which will begin to improve itself. No one will descend from the heavens, appear on the horizon, and begin to educate this enormous kindergarten, which represents humanity. For the first time in history, we are developing in a way where a person creates himself. This is why this crisis does not give us any chance to develop unless every one of us begins to elevate the human in him. Every person must rise to the level of cooperation, compassion, mutual work, participation, mutual guarantee and love for his neighbor. This is referred to as bringing yourself up to the human level. We must do this consciously, thoughtfully, with understanding and knowledge of what we are doing. Of course at first we do not know or understand anything. We begin with a series of lessons, conversations, and seminars so that together we achieve certain conclusions and continue to develop little by little. All these conclusions gradually accumulate and collect into a certain image, a single conclusion: We need an environment. And we build our own environment in our class while we study. We are not just students or a group of children, playing as if in kindergarten; we know what we are doing, why we are doing it, and the changes these actions are supposed to make in us. Every person must become a psychologist and a sociologist for himself and other people. Every person must grow to the level of a specialist in the matters of humanity and human nature! Of course there are two opposite states present here. Of course, when you just come to study in the beginning, you might be upset that I am planning to educate you, as if you were deficient. You are not to blame for anything: You were brought up this way; you were made this way, and this is why you are in a state of a crisis. But I respect your ability and your potential to completely correct the face of the world! Today I started the conversation with saying that we are all like the people lost in the desert! That is right, this is our state! And now we must chose a direction, find the way to a good life, and together we will figure this out. And once we figure it out and lay out this path on our own, we will build an abundant world in the middle of our desert! In the News (from Ekonom:east Media Group): “A day with a Greek overtone [Saturday, February 18] throughout Europe as thousands of citizens of the continent, armed with the slogan ‘We are all Greeks,’ mobilize hugely in support and solidarity to the Greeks. “The pan-European call is addressed to all Western Europe citizens in response to the economic crisis and acute problems facing the Greek community. “The protest is scheduled to take place at 14:00 outside the Greek embassies and consulates in various cities from Paris to Rome and Dusseldorf to Madrid. “A similar mobilization has been planned in New York in Zuccotti park in which members of the Occupy New York movement have been camped for months. “Social networks with the slogan ‘We are all Greeks’ indicate that the measures passed on Sunday February 12th are imposing major reductions in salaries and pensions while dismissals of civil servants are also planned. Comment: As we see, a shared concern brings people together, and governments must take this into account; otherwise, they will lose the ability to manipulate the population. The unity of the unemployed and disadvantaged is dangerous, but the authorities in all ages underrate it, much like the government of Syria now. The authorities need to provide a clear answer to the question: “How are we going to fulfill the desires of the nation?” realizing that otherwise, the people will eat them alive. The only correct answer will be integral upbringing and reasonable distribution! In the News (from Daily Mail): “While unattached women are too busy enjoying their freedom to care about the absence of a companion on February 14, men feel lonely if there are no cards through the letterbox, according to a study. “While more than half of unattached women say they are happy as they are, only 39 per cent of single men feel the same. And less than a third of women say they actively dislike being alone, while 70 per cent of men admit feeling this way. “Traditionally, women were looking for love and the security provided by a man who was the breadwinner. However, women’s success in the workplace has led to increasing financial independence. “At the same time, many men still believe women should take care of house and home – and so feel ill-equipped to do it themselves when they don’t have a partner. “Single women said they can buy themselves more treats and more than half have plenty of time to spend with their friends compared to around one in three who are in a couple. “Of those who are single, it is women who are happiest. Many put their education and careers first, and as a result, women are more financially independent and self-sufficient than ever before. My Comment: Our selfishness has reached its maximum. The indicator of this is the dissolution of the basic unit of society, the family, and its replacement with other egoistic surrogates. The systemic crisis will force us to change our attitude to the world, and we will have to rise above our self-interest to the connection between us. The family will return, but in a new image, with a new goal: To achieve an upper harmony, people will create connections above their egoism, both in the family and in society. In the News (from Postimees.ru): “Disconnection leads to the isolation of Europe. The debt crisis has highlighted the fact that despite the rhetoric of ‘unified Europe,’ we are ready to point at each other and blame others. My Comment: All this is tied to a single action—integration, unity, above all the differences. Otherwise, Europe will be defeated on all fronts: economic, political, and ideological. This is how the evil of our nature is disclosed in each person, nation, and state. We only have to correct it—and happiness is so close…. Question: What is the importance of the conventions that are intended not only for us, but mainly for the world? Answer: The point is that we need to take advantage of each convention in two ways: to advance upward toward the Creator, to the attribute of bestowal and love, and simultaneously to move downward, towards the remaining 99%. Essentially, we need to separate the two and afterward to connect it all into a single whole. This is what we have to do. Thus, at each convention we will talk about our advancement forward, upward, and also about our movement downward to all of humanity since one cannot exist without the other. We received the disclosure of the wisdom of Kabbalah, the disclosure of the condition of unification, the attainment of the spiritual quality, because we need to call for the unification of and connection with all the others, to rescue humanity from the state it is in. This is why we are like this; otherwise, we wouldn’t have been given this. 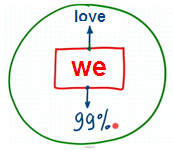 We connect all of humanity: the 99% and the Creator. Under no circumstances can we forget either of them. Between ourselves, we must go forward, to the attribute of bestowal and love in order to become one whole. For this we need the connection with the Creator. And all of this is in order to bring humanity to the same state. It is precisely because the ego and the crisis have manifested in the world enough that we were given the opportunity to bond between us, to work with the book, to understand the system, to discover the world, and in this way to advance it forward. This is the only reason we exist. 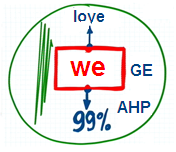 We represent Galgalta ve Eynaim (GE), and all of humanity is the AHP. If we advance forward, we will be able to attain only a small illumination. Our advancement needs to be as follows: We need to advance toward the Creator, and the Creator will lower us down toward humanity. Afterward we will advance a little more toward the Creator and then back to humanity. And thus it alternates. Otherwise GE won’t have the Kelim (vessels), desires, since GE do not have enough Aviut (coarsenss or thickness of the desire). All of the Aviut comes from the AHP, from humanity. Thus we must, like from Egypt, take from there all the Kelim and “drag” them with us. When we bond with them and begin to transfer their Aviut, we will begin to advance forward with the help of descents and ascents. 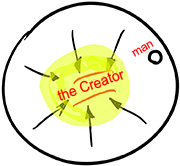 Thus we will move all the time, in a circle, until we bring the entire humanity to connection with the Creator. 1. The extent of the appreciation of the environment. 2. The size of the environment. Everything depends on the connection with the group. From it a person draws the strength to connect, and it is there that our might grows until we reach the Creator who is in the center of the environment. But if a person doesn’t connect with the environment, he has no one to receive the strength from, and so he doesn’t find the upper force in the center. Many details make up our connection: positive ones and seemingly negative ones. They belong to different levels of Aviut, meaning the coarseness, “thickness” of the desire. A person cannot do anything with his Aviut by himself. He must receive stimuli from the environment, such as needs, obstacles, and problems. When he overcomes them, he turns to the friends again because it is impossible to advance without enough negativity either. So there is a lot of work to do and it is all in the society. Only there does a person gradually acquire the thickness and the purity of the desire. Eventually, his efforts add up to the necessary measure and he discovers the Creator within the unity with the friends. If a person doesn’t see the Creator among the friends, it is a sign that he hasn’t connected with them yet. If he doesn’t understand that the Creator is revealed specifically there, it means that he is still far from unity. A person must at least believe the sages that the Creator is revealed within our unification, in its center. On the way to it one must acquire great thickness of the desire, experience many disappointments, and at the same time overcome many obstacles and refine himself. Both things are necessary. If a person doesn’t despair, he can very quickly discover the Creator, like in the exodus from Egypt. Question: How can we plead with the Creator correctly? I encounter my egoism everywhere…. Answer: You have to realize one thing: Everything is ready for your birth, but if you don’t start acting and fighting, Pharaoh will keep you in prison and won’t let you free. On one hand, your egoism gives you an opportunity to develop, but on the other, it doesn’t let you exit. There is a need for external pressure, greater suffering, wars, and misfortunes—just so you will desire to be born. A spiritual birth is not a mechanical process; it is impossible without your consent. You reveal your desire from within and then you feel a new life. Without it, you can’t transition to a new stage. So, everything is ready for your birth, and everything depends on you. Clearly, we are now numb, dormant. How can we awaken? For this we need to spur everybody to action. We need to apply effort, which doesn’t pass in vain, but accumulates into a critical mass. The path to your birth, if you accelerate it, is not a gradual ascent to the summit whereby you rise higher and higher. Rather, you experience a sequence of ascents and descents, until their sum (∑) brings you to the point of birth. It happens all of a sudden, you are not aware of it until the last moment—suddenly you are born into the world in the escape from the Egyptian exile. This way you don’t need to grow by experiencing the intensifying misfortunes and birthing pains. A few pangs that you arouse yourself are enough. After all, you do it consciously and sensibly; you see what is happening with you and hence don’t have to rise by the degrees of suffering. The understanding of the process covers and compensates your misfortunes, and torment turns into a yearning for the Light. Instead of suffering from wars and other corporeal disasters, you are burning with impatience: “Why haven’t I been born yet?” A small pain at the human degree replaces huge misfortunes at the still, vegetative, and animate levels. A tiny effort in conscious progress is a billion times more effective than forced efforts on the long path without acceleration.